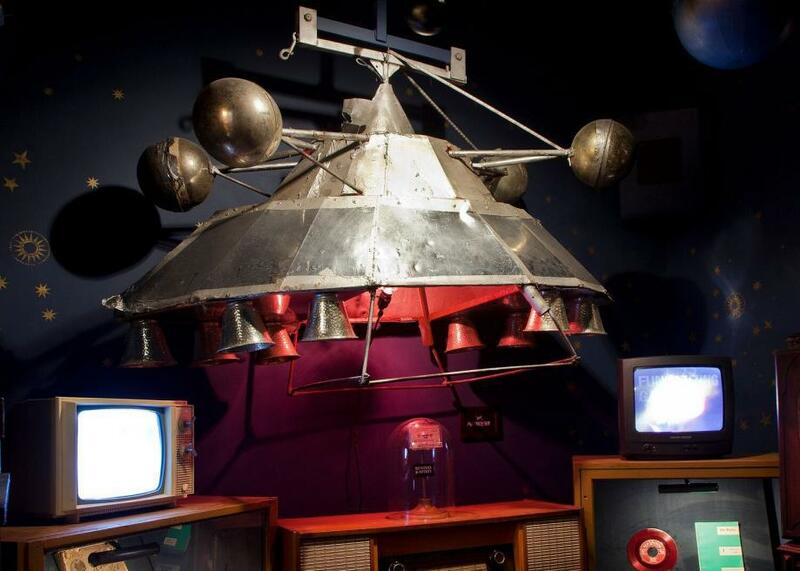 Indianapolis, Indiana’s Museum of Psychphonics holds one of Parliament's Baby Motherships. The museum’s small collection has at its core the lesser-told stories of Indianapolis’ history and its connection to black American music, as well as more general themes of Afrofuturism, says Michael Kaufmann, its founding director. It hits the lofty note, too, of the music of the spheres—there are planets hanging from the ceiling, and it’s named after the sound of breath and the sound of mind. The museum is located in Indianapolis’ Fountain Square neighborhood, in the Murphy Building; to reach the museum, you enter into what looks like a very small record store and pass through a heavy red curtain, inspired by the one in a portrait of Charles Willson Peale, the early American painter and collector. Past the curtain is a warmly lit space, just 11 by 10 feet. The display cases are made largely from old musical instruments; the collection includes “currencies of amusements and fallen empires,” like the Soviet Union, an ashtray from the Burger King where Elvis was spotted after his death, and samples of dirt from venerated places, including religious pilgrimage sites, places where UFOs were spotted, and the arena where Elvis gave his last performance. There’s also music—the 4th dimension—commissioned for the museum; one piece is inspired by Scapper Blackwell, a blues guitarist who recorded and was killed in Indianapolis. The main attraction, though, is the Parliament Funkadelic Baby Mothership, a prop from the group’s road show. The Baby Mothership flew over approximately 300 audiences: It would appear to land on stage, and the big Mothership would appear, from which George Clinton would emerge. The Parliament Funkadelic road manager Tom Battista is an Indianapolis native, and he and his family were responsible for creating the show’s props. When Kaufmann found out the Baby Mothership was still around, he thought: “That’s too awesome to just have it in storage. We should put it on display and celebrate it.” He had been thinking for a long time about creating a wunderkammer of some kind and recruited artist Kipp Normand as the curator and designer of the project.